It is important to have one crunchy dish with every meal. Why? Foods that crunch release pressure and create relaxation. In today’s modern hectic world, we can use some relaxation. The crunch should be loud enough for that person sitting next to you to hear you chewing. This crunch is best to come from fresh vegetables rather than something dry or baked such as a pretzel or potato chip. This salad, made with crisp romaine, meets that crunchy need. Relax away! Tear or cut romaine leaves into large pieces. 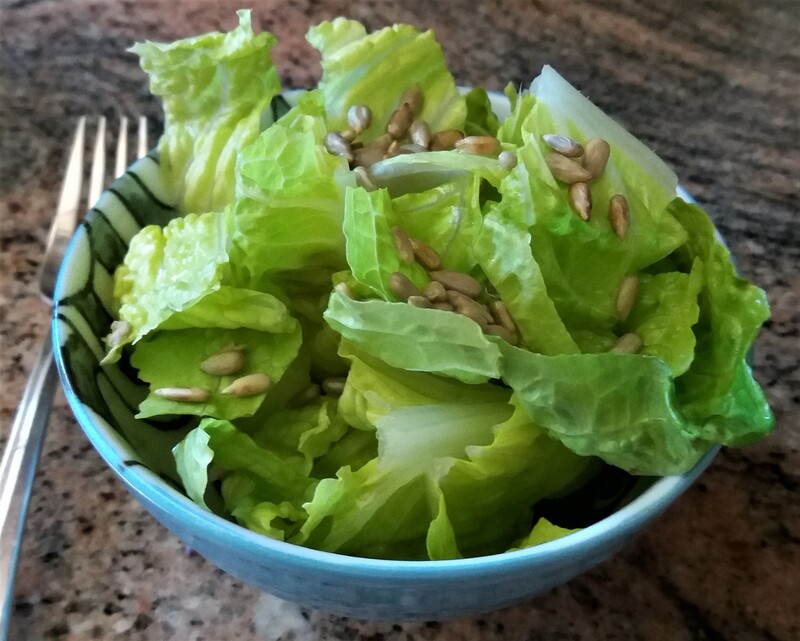 Place in a bowl and top with toasted sunflower seeds. Dressing: If using garlic, place garlic and salt in a mortar and pestle and grind into a paste. In a bowl, place olive oil and lemon juice. Add the garlic paste and mix well with a whisk or fork. Add a little lemon zest if you wish and mix one last time. Pour over romaine leaves. If not using garlic, place olive oil, lemon juice and pinch of salt in a bowl and mix with a whisk or fork. Add a little lemon zest if you wish and mix one last time. Pour over romaine leaves.